David Hiltner is currently the Executive Director of Red Lodge Clay Center in Red Lodge, Montana. In the summer of 2005 David, Maggy and their daughter Sophie, moved to Montana to establish the Red Lodge Clay Center. 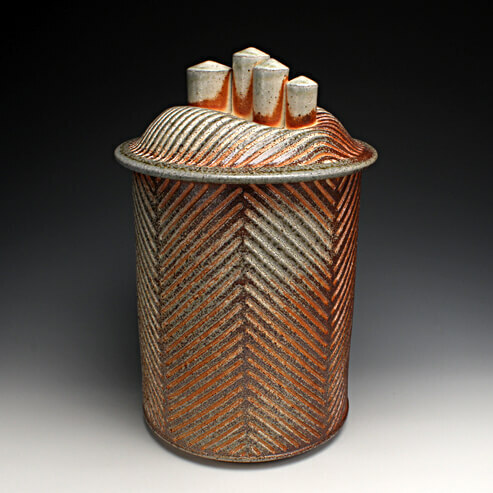 Prior to moving to Red Lodge David was an Assistant Professor of Ceramics at Wichita State University in Wichita, Kansas. Before joining the faculty at Wichita State University in 1999, he taught at Syracuse University, Northwest College, and at the University of Alaska, Fairbanks. He received his B.F.A in Ceramics from Wichita State University in 1993 and completed his M.F.A at Syracuse University in 1997. Corn is a food loaded with controversy and content. The American ideal of corn is very interesting to me. What’s so wrong with high fructose corn syrup? Why does the government subsidize corn? How many byproducts of corn are in the foods we eat? How much money does it take to produce an acre of corn? How many gallons of gasoline does it take to plant, harvest and truck corn products to market? Born and raised in Kansas, much of my time was spent hunting in the fields and working on my family’s farm. The diverse weather transformed the landscape into vivid colors and textures. Slowly, the fall colors faded against the gray of winter. Light snow covered the repetitive rows of milo. Spring storms brought rain, flooding the fields, filling ditches, bringing nourishment to the wheat, moving the soil, eroding it to its own liking. The dry hot summer wind would crack the earth open, and the landscape would be transformed into a surface resembling an Old Dutch master’s painting. I am interested in rural landscapes, silos, rolling hills, and furrowed fields. The patterns, textures, and colors translated into the vessel are memories, moments, and thoughts frozen by fire. These vessels are created to celebrate the land that inspires and sustains me. I also love to fish. Mostly, I love to catch fish and put them back. My wife says I just love to pet fish. This is true and exemplified by the collection of photos I have of me petting fish. Although, if I caught a fish on every cast I don’t think it would be as appealing. I say this with some doubt, because I have yet to experience this phenomenon and would like to at some point so I could give you a definitive answer on the matter. But for now, let’s go with the idea that it’s the ones that get away that keep me coming back. Fish create uncertainty and I believe there must be a sense of uncertainty in a creative act. Uncertainty leads to questions, questions to answers. Uncertainty and anticipation are made worthwhile when there is a question answered by a successful piece. I began making my “fish boats” after spending a summer teaching and fishing in Fairbanks, Alaska. These vessels are moving towards a trophy-like format. Fish are deserving of a trophy. My work celebrates the fish I chase and takes my mind to that place on a river where the tug on my line sends the adrenaline screaming through my veins. To that place on the river where the earth has been eroded and rocks, water, soil and vegetation come together to speak about the matters of texture and surface. I am alone in that place for a moment to watch and be thankful that I can be on the river fishing.